Pimples Scar Reduction: Acne lesions or pimples happen when the hair follicles (or “pores”) on the skin become plugged with oil and dead skin cells. A plugged follicle is the perfect place for bacteria to grow and create the red bumps and pus-filled red bumps known as pimples. Moderately severe acne, which includes red inflamed pimples called papules and red pimples with white centers called pustules. Severe acne, which causes nodules – painful, pus-filled cysts or lumps – to appear under the skin. Serious scarring is caused by the more severe forms of acne, with nodules more likely to leave permanent scars than other types of acne. Post-acne scarring is a very distressing problem. Atrophic acne scars are dermal depressions commonly caused by destruction of collagen after inflammatory acne. Many therapeutic measures such as chemical peeling, subcision, dermabrasion, fillers and punch techniques have been performed to improve acne scarring but with sub-optimal outcomes. Ablative lasers such as Er:YAG lasers or CO2 lasers produce significant improvement at the cost of long recovery times and post-inflammatory hyperpigmentation. 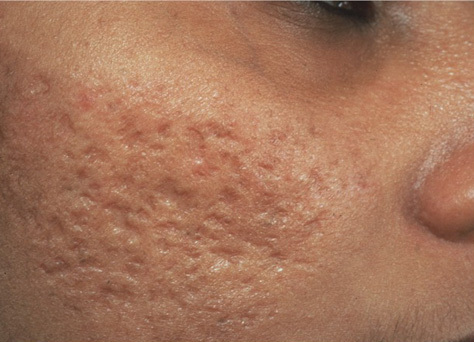 Recently, newer techniques such as microneedling fractional radiofrequency (MFR) has been shown to be clinically efficient in managing acne scars without causing direct damage to the epidermis. MFR device works by creating radiofrequency thermal zones without epidermal injury. After heating the dermis, long-term dermal remodelling, new elastin and collagen formation occurs. The upper layer of the skin will be removed. And the skin becomes smooth. It usually takes between 3 and 10 days for the skin to heal completely. Multiple sessions may be required for a perfect result. It is closely depends on the condition of the skin and the type of the pimple scar.